CARVILLE, La. 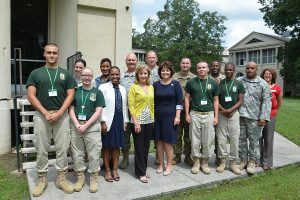 – The Louisiana National Guard’s Youth Challenge Program (YCP) welcomed the First Lady of Louisiana, Donna Hutto Edwards to their campus at the Gillis W. Long Center in Carville, Sept. 7. Edwards learned about the YCP’s educational benefits to at-risk youth during a presentation by Col. Michael Borrel, director of educational programs for the LANG. Edwards also toured the campus, made a classroom visit and had a cafeteria lunch with YCP cadets and staff. 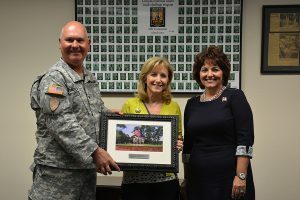 The LANG’s YCP operates three separate campuses: Gillis W. Long Center in Carville, Camp Minden in Minden, and Camp Beauregard in Pineville. More than 21,000 cadets have graduated from the program since it began in 1993. The mission of the LANG YCP is to intervene in and reclaim the lives of 16-18 year-old adolescents, producing program graduates with the values, life skills, education, and self-discipline necessary in order to succeed as productive citizens. YCP offers young people an opportunity to improve their lives through participation in a free, innovative and alternative school.